Kibei Nisei Roy Goro Akune passed away peacefully on November 4, 2018 surrounded by family after complication from gastric cancer surgery. He was the youngest born in Turlock, California to General Store owners Riichiro and Yukie Akune on March 11, 1932. His siblings were Toshiko, Masami (Harry), Sachiko, Kenjiro (Ken), Kikuko, Saburo, Yoshie and Shiro. His step siblings were Toshie and Chieko. At just a year old his Mother had passed away. In 1933, the family went back to reside in Kagoshima Kominato, Japan. At the age of 18, in 1950 Goro Akune boarded a ship from the port of Yokohama, Japan to San Francisco, California. His elder brother Ken picked him up from the San Francisco Bay harbor to be with his many siblings who had resided in Southern, California. Goro later moved to Chicago following his eldest brother Harry who was attending De Paul University. It was after watching a Roy Roger’s movie at the famed Biograph Theater that he decided his American name would be Roy. The singing cowboy. Roy Goro loved to sing. He served in the US Army and was a Combat Engineer. He was stationed in England where he worked on the reconstruction of the runway at Heathrow Airport. He married his childhood sweetheart Tamako Harazono from Kominato Minami Satsuma Shi, Kagoshima at the Midwest Buddhist Church in 1955. Both Roy and Tamako went to chick sexing school at the National Chick Sexing Association on LaSalle Street in Chicago. They were both designated for assignment in Nebraska. Their daughter Shuko was born in Wahoo, Nebraska. They later opened their own dry cleaning business Omar Cleaners in Chicago. Because he was able to speak both Japanese and English, Roy also worked at two different Japanese companies, Onkyo Corp. and Nippon Express. For many years both Roy and Tamako were very active in the Kyushu Kenjinkai in Chicago. Serving as President for many years and his sister in law Kimie Sugano served as the recording secretary. After his beloved wife Tamako Akune passed away in 2010 and living in Chicago for 62 years, Roy moved to California in 2013 to be with his daughter Shuko and husband Michael Pacelli. Roy was so happy spending time with his elder brother Ken Akune and the Akune, Ego, Taguchi and Tanaka families. Roy attended Tai Chi classes at the Gardena Baptist Church where he met great friends. He loved Japanese Enka karaoke singing where he would perform for the Centenary Church, the Nishinaka family and Murasaki Karaoke Club. 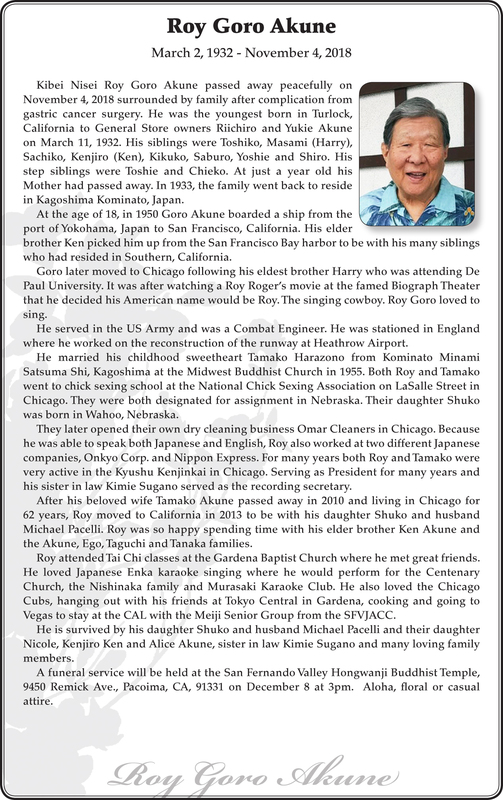 He also loved the Chicago Cubs, hanging out with his friends at Tokyo Central in Gardena, cooking and going to Vegas to stay at the CAL with the Meiji Senior Group from the SFVJACC. He is survived by his daughter Shuko and husband Michael Pacelli and their daughter Nicole, Kenjiro Ken and Alice Akune, sister in law Kimie Sugano and many loving family members. A funeral service will be held at the San Fernando Valley Hongwanji Buddhist Temple, 9450 Remick Ave., Pacoima, CA, 91331 on December 8 at 3pm. Aloha, floral or casual attire.